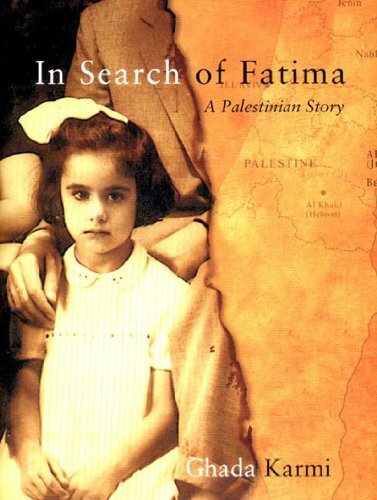 In Search of Fatima: A Palestinian Story by Ghada Karmi tells a sad story of lost. In 1948 when Palestine ceased to exist, so did Ghada Karmi's childhood and her identity. From that day Ghada spent a lifetime trying to find out who she is. This is the story of her search. In Search of Fatima: A Palestinian Story begins in Palestine. Ghada Karmi was born during the turbulent years of World War II to a well-educated Palestinian teacher working for the British Government and his then-modern social wife. In 1948, amid exploding bombs, Ghada, aged nine, and her Moslem family was forced to flee their home in the elegant Qatamon suburb of Jerusalem and seek refuge with her mother's family in Damascus. She had left behind her beloved dog, Rex, the family housekeeper & Ghadi's self adopted second mother, Fatima, her childhood, and her national identity. Palestine no longer existed. There was now only the newly formed country of Israel. After a year, her father landed a job with the BBC in London and the family relocated to predominantly Jewish Golders Green section of London. There she attends an exclusive girl's school, college, and finally went to medical school to become a doctor. Surrounded by Jews and native Brits, Ghada came to think of herself as an English person. (She comments it was easier than trying to explain that she came from Palestine, a country that no longer existed.) However, each time the ongoing Middle Eastern situation heated up, Ghada was reminded that she was NOT an English woman, but a Moslem Arab. She was watched, suspected of potential terrorism, and mistrusted. Eventually, Ghada became the founder and spokeswoman for Palestine Action, a British based group that lobbied for displaced Palestinians. Finally, Ghada was forced to return to the place of her birth in order to confront and to come to terms with her identity and her past. In Search of Fatima is not just a biography of one woman's search. It is an allegory for the Palestinian people. It is the Middle Eastern crisis told from the perspective of the Palestinians. The strength of Ghada's story is her unique ability to tell the story with Eastern passion and with Western sentiment. She tries very hard to walk the middle ground and when she strays too far into a biased view, she notes it and comments on why she did it. She also addresses the internal struggle of many Middle Eastern women as they try to hold on to their traditional culture and heritage, while living in a high tech and high fashion world. Ghada Karmi is a physician, author, and political spokeswoman. She has her Doctor of Medicine from Bristol University. She founded Palestine Action and a medical charity. She is also the author of Health and the Movement of Labour After 1992 (1991), The Ethnic Health Handbook: a Factfile for Health Care Professionals (1996) and Jerusalem Today: What Future for the Peace Process? (2000) She is also the co-editor of The Palestinian Exodus, 1948-1998 (2000). In Search of Fatima is a poignant and passionate story about one woman's struggle to define her place in Western culture as an educated Middle Eastern Moslem. Ghada is extremely articulate. While it is slightly biased towards the Moslem-Arab position, of which she speaks passionately, she does try to present an unbiased reflection on her particular views. This is a unique perspective on the Middle East crisis. I give this book the highest of recommendations!